The memories just don't fade away when a pet passes. I have friends and relatives who still talking lovingly about their companions as if it were just yesterday that they sat begging under the dinner table looking for a scrap or waited patiently by a window while their human counterparts returned from home or school. Many people choose to keep some memento of their friends now gone via a box or urn holding their ashes. It's a nice tribute they can keep close to remember the good times. Mike Martino founded Urnaments, LLC to give individuals an option in how to keep their loved ones close after they pass. I find that his Pet Urnaments line provides a unique and elegant twist on the typical box or urn keepsake. Although urnaments take their name from ornaments I was impressed with how versatile these keepsakes can be with fitting into a variety of decors at any time of the year. 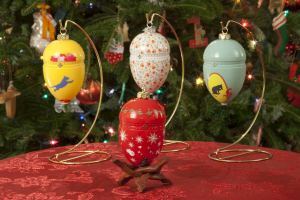 An urnament is an egg-shaped ornament that can be displayed on a couple of different holding structures. Right now, there are seven designs, all tastefully done, but Mike tells me that there are more being designed, including a customized version. Additional stand configurations are being explored for future release as well. Each urnaments holds approximately 7 ounces or the equivalent of a 7 pound pet. For me this means that there is the opportunity to sprinkle some of the remains over my pet's favorite places while keeping some of them close to home. 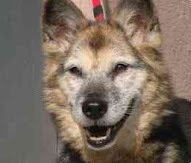 The reviews that I do here at SeniorPooch.com are all meant to help the senior pet owner. In as much as the transition from life to beyond is part of the journey that pets take with us, I wholeheartedly endorse Urnaments for the respect they show for pets and their owners and the ongoing memories that they support. Erin Palumba of Ridgewood, NJ echoes my sentiments by saying, "Pet Urnaments are a beautiful tribute to companion pets." If you're interested in a Pet Urnament, I'd recommend you visit their website at www.urnaments.com. You can use coupon code SEP1 to let them know that you came from SeniorPooch.com. Disclaimer: A portion of sales when using the coupon code goes back to SeniorPooch.com. No other reimbursement was provided by this review. Like all reviews I try to represent a fair and unbiased opinion of the products and services in question. Thanks for the thought PTP. Taking time to grieve is important as well so you can properly cherish the memories you've had with your pets. Loosing a pet is no less than losing someone extremely closer to you, and you need to perform its last rites in a similar way.